Have You Voted In A Litter Referendum? M@ Have You Voted In A Litter Referendum? Bold experiments with democracy are taking place across the capital. An inanimate object wants to know our opinion at every turn. Where once we sorted rubbish for recycling, we now post plastic and paper according to personal viewpoint. Every unwanted item is now a potential vote. This is a refuse revolution; a ballot of bins, boxes and bell jars. 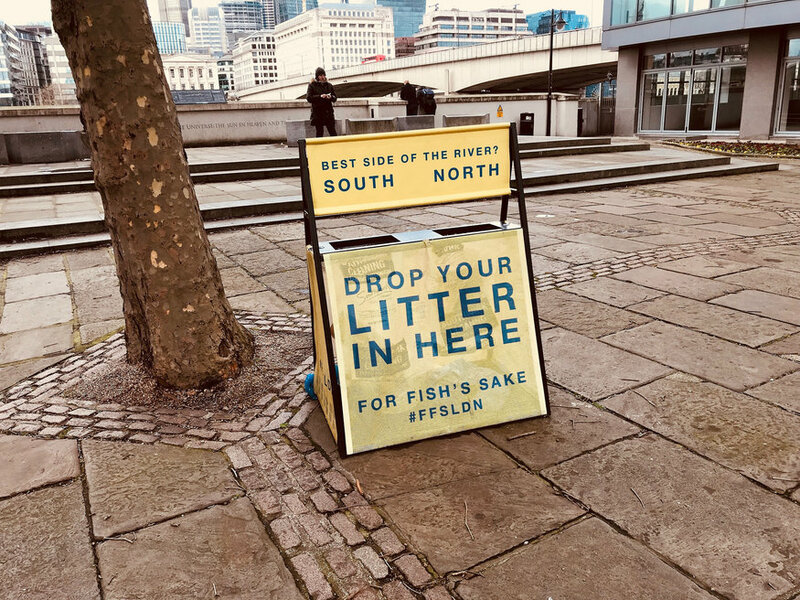 But how much faith can we place in the wisdom of the litter-picking crowd? Take the riverside referendum above. We're asked to declare the 'best side of the river' by discarding into the appropriate slot. The correct answer is, of course, 'South', but this is a rigged vote. Most people are right-handed and so we would expect more trash to fall into that chute. The petit polling station is also misplaced. To avoid bias, the ballot box should be sited on neutral territory — not facing out onto the dramatic City skyline of the north. This trashy voting system has been dubbed (by us) skoupidocracy, which is Google Greek for 'by the rule of litter'. The concept has also been trialled with fag butts. This is good. Unlike cans and bottle, cigarette ends cannot be recycled. The downside is that you have to be a smoker to take part. Clean-lunged citizens with a burning opinion on the chicken/egg riddle are disenfranchised. Putting that aside, it seems that the denizens of Bloomsbury favour an egg-shaped solution to this ancient conundrum. And the poll reveals something new. Look at the stubbing action. 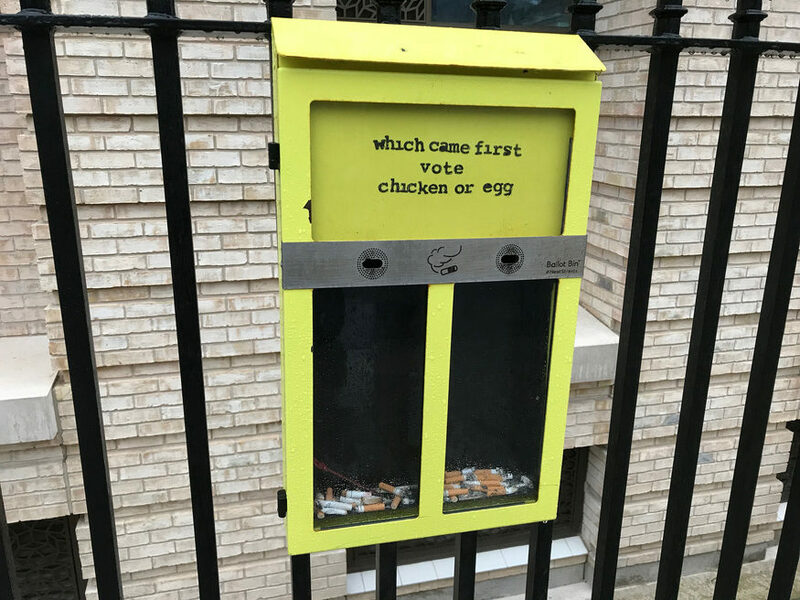 Advocates of the chicken appear to be more profligate with their tobacco, whereas yolk-folk burn their smokes down to the filter. That right there is a sociology PhD waiting to happen. Fun-sized ballots can be found indoors, too. 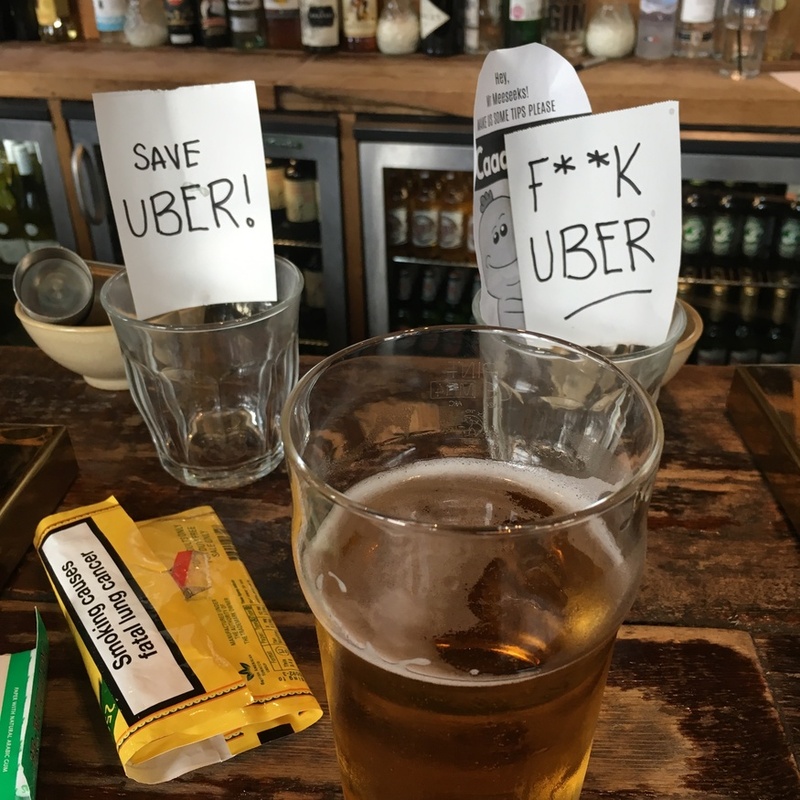 Idiosyncratic Kentish Town boozer the Abbey Tavern has a bit of political fun with its tips jars. As with the fag poll, this drinkers' plebiscite is flawed. Those casting a coin can see how previous barflies have voted. With other customers watching, one might cave in to peer-pressure and choose the option that's proved most popular. Even the supermarkets are after our views. Here's a poll from a zone 6 Tesco. In this case, we're asked to choose among three good causes: an unusual village green, a community choir or a food bank. Customers cast their votes with blue tokens that are sporadically given out by till staff. 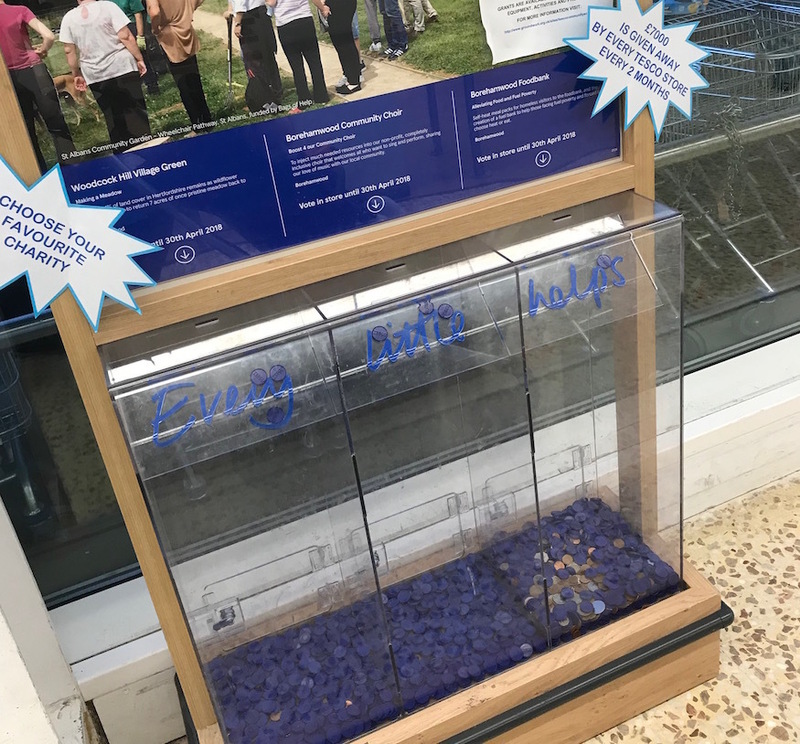 The good cause with the most votes gets a wad of cash from Tesco, while those in second and third place get slightly lowlier wads. It's a virtuous take on the mini-referendum, and one where customers are not afraid to break the rules and post coins instead of tokens. Careful where you post your trash — a misplaced wrapper might unleash armageddon.